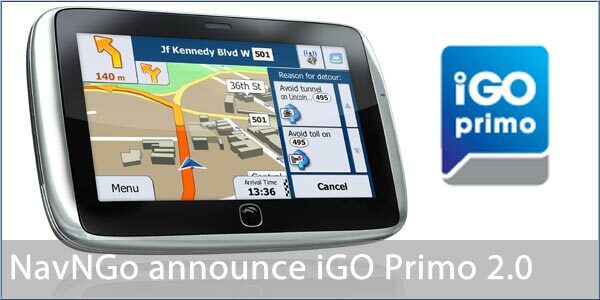 NNG (formerly NavNGo) has announced iGO primo 2.0, an upgrade to their premium navigation software. This will be integrated into their clients SatNav devices in the near future. This software is claimed to be intuitive and to predict the drivers actions. A key feature of the new software is the ability to adjust your route dynamically based on your driving speed even in the absence of real time traffic data confirming a problem. When the journey speed drops unexpectedly the software will attempt to find an alternate faster route to your destination. Other features in the new software are: Parking and Destination assistance; rerouting options; speech recognition; personalisation; and advanced truck features. Budapest, Hungary � NNG has now introduced version 2.0 of its flagship navigation software iGO primo� to hardware manufacturers worldwide. The new software version marks a major leap forward in the evolution of personal navigation by moving beyond mechanical guidance. For the first time, a navigation software merges all available resources such as map and POI data, registered driving speed and the ability of fast recalculation in a single superior navigation experience. Recently implemented intuitive features interpret the user�s behavior, and offer fast solutions in everyday traffic situations. In response to a reduction in driving speed, the Congestion Detour feature recognizes traffic jams on highways, even if they are not indicated by the traffic service. Instead of blindly and stubbornly continuing with the original route, iGO primo� 2.0 instantly calculates and offers detour options in order to avoid lost time in the traffic jam ahead. Similarly, Real-time Route Alternatives are given in the city when the vehicle approaches junctions too slowly due to congested roads. If a driver leaves the highway despite the planned route ahead, the Hints upon Detour feature considers potential reasons behind this behavior instead of forcing the driver back onto the old route as in standard navigation solutions. It provides appropriate hints (fuel stations, rest areas, etc.) and upon acceptance calculates a new optimized route. Also part of the Intuitive Navigation feature package in iGO primo� 2.0 is the Parking around Destination assistance which offers immediate help in finding suitable parking places, ranking them in order of distance from destination without having to search in the POI database. As well as being the first intuitive navigation solution of its kind, iGO primo� 2.0 offers these suggestions in an unobtrusive way. The user is presented with a hint on the navigation screen and does not have to sacrifice driving concentration while searching through features, options and POIs. Instead, the driver can simply accept the re-calculated route that is blended into the screen. �Continuous research and the experience from our global partnerships have enabled us to deliver the intelligent and proactive navigation software that drivers need. iGO primo� 2.0 is fast and reacts to the driver�s behavior; route information is easy to find and offered at the right time. Most of all, by doing away with mechanical behavior we�re helping to avoid driver frustration!� says P�ter Balogh, interim CEO of NNG LLC. Additional novelties in iGO primo� 2.0 include improved voice destination entry and personalized driver profiles allowing multiple user settings. Advanced truck features are available for manufacturers of fleet solutions. The product update replaces version 1.2 in the iGO Navigation portfolio and is immediately available to partners worldwide. ....and to predict the drivers actions. Does it have a button for "I am Drunk" and then route where it knows the police are NOT in waiting?